Gotham City is a dangerous place, rife with mobs and corruption in the city government. Banks get robbed in broad daylight, and the citizens are frozen in fear of what could happen next. Only one mysterious man stands up for what's right, and that man dresses like a bat. 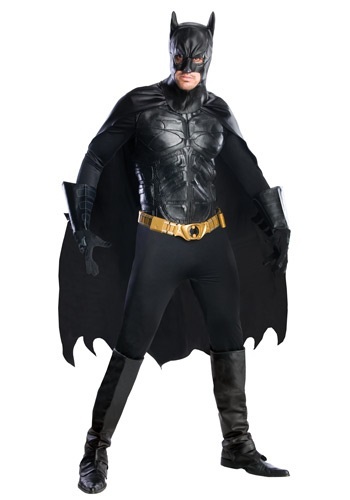 Suit up in this Grand Heritage Batman Costume, from the epic superhero movie The Dark Knight, and become the hero your city deserves! The mobsters of Gotham are so vicious and well-connected, the cops can't get any dirt on them without breaking the law, themselves. That's where Batman comes in, since he's ready to do whatever it takes to find the evidence that can really put the mafia away for good. (no matter how many broken ribs or dog bites he gets) But when Batman's shadowy acts inspire a criminal mastermind like The Joker to play his own twisted games with the city, the Dark Knight will have to put his detective and fighting skills to the test to stop him! It won't be easy, but pushing on no matter how tough things get is what separates the real Batman from the posers. That, and the real Bat doesn’t wear hockey pads. You won't be wearing hockey pads either when you don this highly detailed costume! It's modeled to look like the state of the art battle armor that Batman wears while he's brawling with The Joker and his henchmen. This costume includes everything you'll need to look as fearsome as the Dark Knight, so all you need to do is decide if you want to take The Tumbler or the Bat-pod to the Halloween party!